A Medium Rectangle is an advertising space that measures 300-pixels-wide by 250-pixels-high (300×250). Medium Rectangles are big and noticable and appear on the right side of our pages. You can’t miss them – especially because Diabetic Gourmet Magazine doesn’t have clutter and ad noise to distract readers from your advertising. Sample Medium Rectangle. IAB Standard Size. Video advertising is allowed, but audio/video must be user initiated. Delivery limitiations can include time of day, day of week, specific date, language, country and browser. Advertising appears within the content areas where users are engaged. Multiple creatives may be run at the same time during an ad campaign, giving advertisers the opportunity to test the effectiveness of individual creatives and change the creatives they use anytime during a campaign based on each individual button’s performance. Advertisers can extend elements from offline ad campaigns, such as direct mail, TV, Radio and print publications, and tie them into their campaign – or they can incorporate them as part of a campaign that is using other ad sizes. Premium, above the fold banner (top right, beside content). Please contact our friendly advertising coordinator using this contact form or use the contact information that follows it. 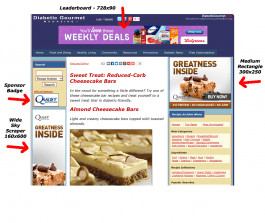 Great news -- women account for 79% of the Diabetic Gourmet Magazine audience! 73% of American women have printed a coupon from a website and 2 out of 5 have searched for a product because of an online coupon.